My work is about building a platform that allows people from a range of disciplines and backgrounds to exchange ideas and energies, so that they can work together towards a goal or transformation. Oftentimes these projects include working with local laborers, academics, engineers, builders, community members, activists, artists, poets, and anyone else that is willing to be involved in something experiential and participatory. Before Matthew arrived in Rijeka, he already expressed one essential working methodology that would guide his project: a commitment to act as a conductor or community organizer without ‘topdown’ imposition. Over the course of four months of being present in Rijeka, and during the many months between the two periods of residency, Matthew collaborated with seven Rijekan artists to create a series of artistic installations on the pier, collectively titled Pier Shear/Striženje Lukobrana (on view between April 21 and May 21, 2012). The collaborating artists were Milijana Babic, Tomislav Brajnović, Vesna Jakić, Marina Mikolčić, Nika Rukavina, Bruno Velčić, and Dražen Vitolović. Reflecting on the pier as a place for our attention, Matthew wrote: “It’s like the High-Line in New York when they turned the unused elevated train tracks into a park: there is really only one reason to go there and that is to have time to walk and think.” Matthew considered the 30-minute walk to the end of the pier as a journey to the quietest, most intimate part of Rijeka. All eight of the installations that comprised Pier Shear/Striženje Lukobrana were located towards the far end of the pier. Matthew was intrigued by the hard materiality of the site—the concrete, steel, and rock—and its permanence. Indeed, these are qualities of Rijeka itself. He was also struck by the pastoral beauty and rigour of the agricultural life that surrounds Rijeka, especially in Istria and on the nearby islands of Krk and Cres. Sheep graze freely over the land; their meat and milk offering steady sustenance. The sheep are also part of popular consciousness, even appearing as giant puppets in the annual Carnival March on the Korzo. But it was in the wool that Matthew saw another metaphor: one of unrealized potential and undiscovered value. The raw wool of this region is considered to be useless—too coarse for clothing—so it is often piled up and burned. Its only real use—when it is cleaned and brushed into swathes—is for making felt. Matthew saw an opportunity to juxtapose the repurposed pier (a hard, concrete, industrial object) and the useless raw wool (a soft, abundant renewable resource) to create a space for Rijekans to ponder possibilities for the renewal of their city. The pier became a poetic place to think deeply and beautifully, as Robert Bringhurst would say. The sheep, attended full-time by a shepherd, took curiously to the new environment but settled in nicely after they were sheared during the first hours of the opening event. The shearing spectacle was a symbolic nod to the ubiquitous use of wool in the other seven artistic installations. New possibilities for wool literally and conceptually unified Pier Shear/Striženje Lukobrana. According to the interpretive panel mounted next to the works, “these wool artworks address issues of history, current political, social, and economic situations, utopian visions, storytelling, globalization, craft and formal artistic perspectives.” Tomislav Brajnović sees the pier as a point of convergence of two rhythms: the predictable, incessant rhythm of industry and urbanity and the domestic, rural rhythm of agriculture—of sheep. His work, titled Stranded Ship, combines performance and installation to create an allegory for Rijeka’s transformation. In Tomislav’s story of how the sheep got to this part of the world, a ship carrying seven sheep was stranded on the pier during the jugo, a heavy windstorm that sweeps up the Adriatic. Contrasting Tomislav’s allegory with an historical look at the pier, Nika Rukavina created an homage to Rijeka’s storied past and the traditional forms of craft that are nearly extinct. Her felt painting, titled Molo Longo recreates a photograph from 1945 that depicts the destruction of the pier by bombs during the Second World War. This significant moment was the most recent time of crisis for Rijeka before the current economic and social strife that began with the Homeland War and continued after independence from Yugoslavia. Nika reminds Rijekans that renewal was realized once and is possible again. Dražen Vitolović created Margin View, a capsular sculpture perched on the wall of the pier—in his words, “a parasitical object” clinging to the wall like a cocoon for cozy slumber. Shaped by stringers evocative of the hull of a ship, the inside-outside sculpture is a framing device for a ‘pure’ view of the city and the sea, unobstructed by industrial forms. The work beckons the passerby. It’s an intimate place of solace—a cocoon for contemplating the city’s transformation into a new state of being, like a butterfly emerging from a larva. Just down the pier from Dražen’s sculpture, a transformation of the pier itself transpired. Vesna Jakić covered the pier’s surface in a soft blanket of felt, sumptuously shrouding the bollards, the barge hooks, and the concrete wall. Vesna adopted a naval expression for the title of her work—Banjašuga—the word for a part of a boat or length of coast that has dried after being covered by sea foam, leaving behind crusty barnacles, seaweed, and shells. Embedded in her felt blanket were bits of shells and other found objects. She invited others to work with her: children and adults felting the pier. Vesna continues to lead felting workshops with an organization on Cres called Ruta Cres. In contrast to the softness of Vesna’s felt installation, Marina Mikolčić’s metal sculpture titled ruzINA (RUST) is an elegy for the death or imminent death of four major industries in Rijeka: the INA oil refinery, the 3.MAJ shipyard, the torpedo factory, and the port. Installed directly facing 3.MAJ across the harbour, and comprised of steel pipes scavenged from there, the sculpture was welded in one of the abandoned workshops of the torpedo factory. Wool poured out of the cracks and ends of the pipes as bursts of life. The sequence of artworks comprising Pier Shear/Striženje Lukobrana culminated at the end of the pier with an exquisite viewing platform. 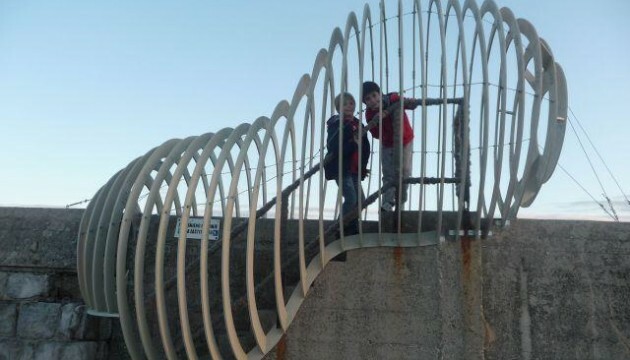 Titled Window, Bruno Velčić constructed a stairway out of railway ties to the raised section beneath the beacon that guides boats around the end of the pier. He covered the area in scrap wood, installed an elegant, minimalist railing, and placed a large wool covered easy chair in the centre—an outdoor living room emerged, designed to contemplate a magnificent view of the sea, of the distant coast of Istria, and of the waterfront of Rijeka. The dismantling of Bruno’s Window on May 21, 2012 was controversial: it had become a destination, a pilgrimage, an intimate place that people loved. Departing from Bruno’s Window, looking out towards the middle of the pier, one more artistic work came into focus: Milijana Babic’s banner with the words, “Ni ovce ni novce”—neither sheep nor money. There is a traditional Croatian saying, “Ili ovce ili novce”—either money or sheep—one can’t have both. In the months prior to Pier Shear/Striženje Lukobrana, a national television company launched an advertising campaign with TV commercials depicting a black sheep searching for deeper meaning by travelling around the world. Huge billboards showed the same black sheep lounging comfortably under the slogan “I ovce i novce”—at last, you can have both sheep and money, just keep watching television. Commenting on the Croatian struggle with neoliberal proliferation in their society, Milijana offers fighting words for the workers who lost their industry, for the residents who lost hope, and for the city that is reshaping its identity. Matthew Mazzotta’s artistic vision for Pier Shear/Striženje Lukobrana seeded new myths for the next chapters of Rijeka’s narrative. In the words of English poet Graham Hough, “the imagination can only be continued by understanding and accepting the myths of the past, because they are part of our being; and by making, out of that knowledge yet extending beyond it, a new myth which is as yet only a part of our being because we catch dim and intermittent glimpses of it.” Matthew and those he invited into Pier Shear/Striženje Lukobrana created imaginative glimpses that persist in the memories of all who walked the pier—and while walking, contemplated. I like to speculate on the wares they have housed and how those wares entered and left their rusty gates…and I wonder, when I walk or sail past them, what use they are put to now, whether they have any purpose left to serve, and what, if anything, their stone walls (generally blind) conceal….A person born near a pier may look upon them with nostalgia, but most find them unsettling. They remind us that Mediterranean ports and markets too have their youth and old age. But Rijeka’s pier is timeless. It rests in quiet contemplation while we ponder the city it serves.